Dots A, B and C must all join dots 1, 2 and 3 using lines. 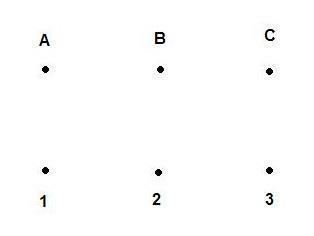 That is, three lines must leave A and go to 1, 2 and 3 respectively; three from B must go to 1, 2, and 3; and three from C must go to 1, 2, and 3. The lines can be curved, but they must not cross or overlap each other, cross or overlap themselves or go through the dots. Good luck and remember, I told you it was evil. Ps - draw on a bit of paper, not your screen.